You won't get a visit from the Dark Knight when you rip off his ride, but you will get a visit from some lawyers. DC Comics, the Warner Bros. subsidiary that owns everything to do with Batman, has filed a lawsuit against a man named Mark Towles for copyright and trademark infringement. Towles operates the "Gotham Garage" in Orange County, California, which makes and sells Batmobile replicas, but doesn't have DC's seal of approval. 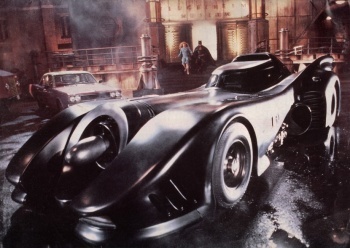 The Gotham Garage offers replicas of the Batmobile from the 60s TV show, the Batmobile from the Tim Burton movies, and the Batmobile from Batman Forever. It also offers a replica of the 60s Batboat. The suit described these replicas as "unlicensed" and "counterfeit," and said that they "willfully" infringed on DC's copyrights and trademarks. While it didn't name a specific amount, the suit said that the revenue generated from products using DC's various Batmobile designs was substantial and that Towles and Gotham Garage had done irreparable harm to DC. DC's suit - which includes a not insubstantial list of the trademarks and copyrights that Towles has allegedly violated - calls for a permanent injunction, preventing Towles from making any more replicas, the destruction of any infringing parts, products, or finished vehicles, and thousands upon thousands of dollars in damages. Having looked at the Gotham Garage site, it looks like Towles might be in some trouble. There's no denying that he does make Batmobile kits and replicas and that, unlike rival Fibreglass Freaks, he doesn't have a license to do so. There are some murmurings on the Gotham Garage forums that DC can't sue over the design of the 60's Batmobile, as it is essentially just a modified Lincoln Futura, a car that DC didn't design. Even if that is the case however, it can still legitimately sue over the Burton Batmobile, and the Batman Forever Batmobile, not to mention all the uses of the Batman logo.